Freight drivers in Scotland may find conditions increasingly difficult as snow sweeps across the country. The Met Office has issued a series of yellow weather warnings for ice in various parts of Scotland. These regions include the Central, Tayside & Fife, Highlands & Eilean Siar, south-west Scotland, Lothian, Borders, and Strathclyde regions. This means almost all of Scotland, bar the east coast, is facing significant weather challenges. Ice poses a particularly obvious peril to drivers of vehicles large or small. Places like Edinburgh, Aberdeen and Dundee will be fine for now, although this may change as weather systems sweep in. However, over the course of today (January 22nd) no weather-related road closures have yet been reported by Travel Line Scotland, with some closed due to other occurrences such as roadworks and the laying of gas pipes. 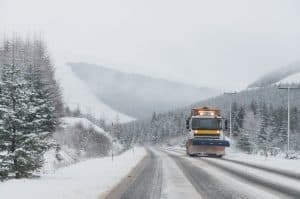 Naturally, the gritters will be out in force, but if the snow keeps coming and the temperatures remain low as expected, many roads could become a lot slower, with drivers being forced to cut their speed. So far this winter conditions have been generally mild across Scotland. Snow mainly confined to the upland areas, but that could now be at an end. For that reason, drivers should take extra precautions to ensure they are safe in the event of cold weather. This includes warm clothing, warm drinks and extra food in case they get stranded for long periods; or even overnight. Indeed, last year’s Beast from the East showed that problems can still occur right into early spring. The coldest temperatures in Scottish winters tend to occur in the eastern Highlands. Those using the A9, for example, may pass through Aviemore, where the mercury has been known to drop to -22C on winter nights. Braemar on the other side of the Cairngorms range can be similarly cold.